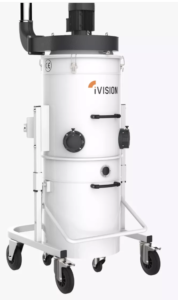 The advanced technology and expertise that have characterized the company since its start are what brought iVision to develop a series of vacuum cleaners with centrifugal fans dedicated to the extrusion working industry. The series is suitable for all machines that cut, drill or mill, producing chips in large quantities that need removal. The range dedicated to this industry is particularly versatile and complete; it includes both vacuums for small workshops and large companies, offering a wide choice to suit every need. 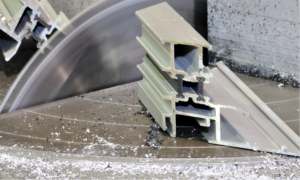 The Extrusion Line was born after acquiring abundant experience in the mechanical industrial sector in order to meet the growing demands of efficient material collection. Every vacuum of the Extrusion Line is equipped with an M Class filter. 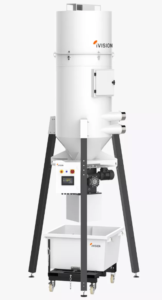 The M Class filter is a high-quality filter made especially for the Extrusion line that enables the collection of at least 99.9% of the collected particles. Thanks to the innovation offered by the Extrusion Line, the time and cost maintenance of your machines will be drastically reduced in relation to traditional methods. Unique in the industry, the innovative fan system of the Extrusion Line is ideal for the aluminum and PVC processing industry. The use of iVision’s fan-powered vacuums in the production process increases efficiency as it drastically reduces the suction time compared to a turbine system. The speed of suction is guaranteed by the increased air flow which allows to work on broader surfaces with the added benefit of capturing even the smaller and more volatile particles. iVision’s fan units are renowned in the world as the best systems for the extraction of aluminum and PVC shavings and are chosen by the most important companies in the sector to improve their production processes. Containers can be of various sizes and shapes, from smaller models that are easily removable to large containers up to 1000 Lt. Where required, cyclone pre-filters that help extend the life of the filters are provided. The entire Extrusion Line is equipped with high efficiency filters in M-Class. 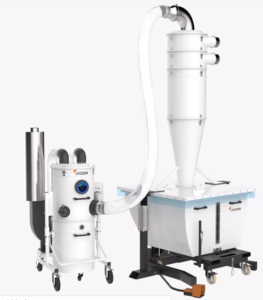 Vacuums of the iV2 Extrusion line are the medium-sized models of the iVision industrial vacuums and come recommended to be used with large, single-head saws or small, double-head saws with a medium production of chips in the work environment that produces little chips and dust. They are industrial vacuums very versatile and their ideal application is for producers of doors and windows using PVC or aluminum. The attention and care given to the design of the vacuums of the iV2 Extrusion line, combined with being composed of robust materials characterize the iVision fan industrial vacuums. iVision has established itself over the years in the world of extrusion and windows and is recognized as upholding the utmost quality, reliability, innovation and efficiency. 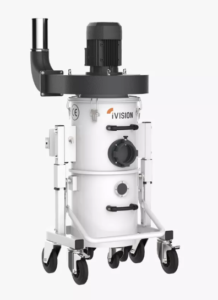 iV3 Extrusion Industrial Vacuum Cleaners are the top best-selling models among iVision vacuums and are usually used alongside double-head saws or automatic cutting centers with a high chip production, or generally in all working fields where huge quantities of chips and dust are created. 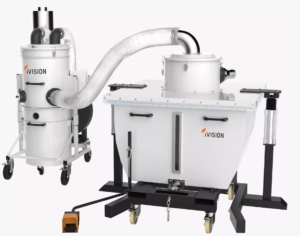 The iV3 Extrusion vacuum cleaners are some of iVision’s most high-performing items, for use with your machine tool. The study and the design research, the sturdy materials and the simple design, are characteristics of a product entirely made in Italy; a real guarantee on the industrial market. The vacuums of the iV Custom Extrusion line are born from our long experience in the industrial machinery sector, in particular in the extrusion and window and door manufacturing world, in order to fulfill the ever-growing demands of chip collection during cutting work. Every vacuum from the iV Custom Extrusion line is equipped with an M Class Filter, a filter of high quality, created purposely for this sector, that consents the collecting of at least 99,9% of suctioned materials. Thanks to the innovations applied to the vacuums of the iV custom Extrusion line, the maintenance of your machinery becomes quick and economical. The iV4 chip collectors of the Extrusion line are dedicated to intensive and continuous machining and are used alongside large double-head saws or automatic cutting centers with a high chip production. In general, chip collectors IV4 with 1000 liter storage buckets are used in all work environments where large amounts of chips and dust are produced. The world’s leading extrusion manufacturers have been using iVision line IV4 systems for several years. Thanks to the high chip collection capacity (up to 1000 liters) and the automatic lid opening system, IVision IV4 is particularly appreciated in the world of the extrusion industry. The iV5 chip collectors of the Extrusion line are dedicated to intensive and continuous machining and are used alongside automatic cutting centers with high chip production. Thanks to the emptying systems by means of a rotary valve, the IV5 chip collectors are used in all work environments where a 24-hour collection is required, due to a considerable amount of chip production. The world’s leading manufacturers have been using iVision IV5 systems in the extrusion industry for several years. 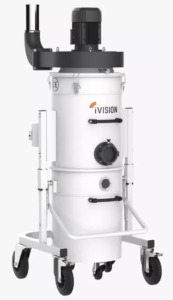 Thanks to their compact dimensions, silence rate and continuous emptying systems, IVision IV5 systems are particularly appreciated in the world of the extrusion industry.